Where is My Favorite Martian Hiding? There was a time not long ago when the solar system was full of life. Mars was a desert planet swept by sandstorms and crossed continuously by intelligent reptiles riding atop lizards the size of trucks. Venus was a boiling marsh covered by dense jungles where pterodactyls with gray skins and little green spots flew freely. Venusians had metallic skins, round heads with childlike dark eyes, and skulls crowned by small antennae to transmit Morse code, which buzzed from one point to another in electric arcs. 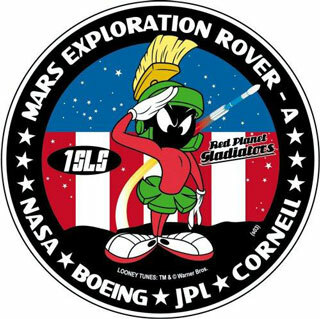 A NASA mission patch. Even in the Space Age, whimsy endures. Does it sound strange? It really should not, because man has always projected his fantasies onto the sky. It is not necessary to add that Mars was the god of war, and Venus, the pretty goddess of love, was his lover. The constellations were full of important beings for the cultures of the world. The sky was a blackboard on which the Polynesians, Nazcas, and Greeks drew turtles, spiders, and bulls, like that stellar bull called Taurus. And what about the Mayan myth of the "Rabbit of the Moon," who was left imprinted upside down on the lunar face after the god Rabbit was crushed in punishment for his cruelty, a fate the reader still can observe at full moon? Perhaps instead of a rabbit, Christian readers will see the Virgin and Child in the same lunar shade. That makes no difference because what really matters is that man has put in the sky his imagination and fantasy, populating the stars with gods and prodigies. Up to the middle of the twentieth century, scientists all over the world believed Mars and Venus were teeming with life. They thought that the coloration of these planets varied with the seasons, with changes in the vegetation living on their surfaces. Such ideas not only appeared in popular science fiction novels, like A Princess of Mars by Edgar Rice Burroughs or Isaac Asimov's Lucky Starr series, but were also expounded by professional astronomers. At the end of the nineteenth century, French astronomer Camille Flammarion wrote the book The Imaginary Worlds , in which he speculated on the type of life forms that would exist on the planets of the solar system and beyond, a book that would have great influence on the minds of its time. A U.S. contemporary of his, Percival Lowell, thought that Mars was fully crossed by a network of artificial channels, built by a toiling race that refused to perish with the climatic change that was drying out the planet. However, reality demonstrated otherwise. The high temperatures and pressures of Venus, confirmed with the first missions of Venera I to the planet in 1961, showed a sterile world. Despite the consequent disillusionment, people continued to believe there was a chance of life on Mars. Nevertheless, after the landing of Viking I on Mars on July 20, 1976, the world was disappointed once again because experiments to verify the existence of life gave negative results. Today we know that Mars has water, and scientists have not lost hope of finding at least viral life forms there. Perhaps it is difficult for them to forget that once the skies were full of life and that Mars had many animals and plants. With all these facts, let us ask ourselves: where is My Favorite Martian hiding? Omar Vega is a Chilean computer engineer. Happily married and the father of three children, two of whom are Chileans and the other Canadian, he lives in Santiago de Chile and works in computers. He has published several articles in Spanish since the '80s, and he write SF tales as a hobby. He dreams of becoming a professional writer some day—hopefully during this life, and if he can convince an editor . . .